Jack Baldwin (winning header) is back in the Posh team at Southend. Photo: Joe Dent/theposh.com. Peterborough United manager Grant McCann wants to see some ‘killers’ in his starting line-up at Southend tomorrow (October 1, 3pm). Posh head for Roots Hall for a League One match having not won for five matches, although four of them have been drawn. Craig Mackail-Smith used to miss plenty of scoring chances for Posh. But McCann has been busy keeping his team’s confidence high. He believes his side have generally played well over the first 10 games of the League One campaign. “Apart from the defeat at home to Bradford and parts of the game at Oxford, we have played okay,” McCann stated. “We could easily have had a few more points. We’ve certainly been good enough to be on more points and higher up the table. “It’s easy to get down when you miss as many scoring chances as we have, but at a meeting we had this week to review the first 10 games there were many positives. “Of course we can improve in all areas, defensively, ofensively and in terms of discipline, but we are not far away from beating someone three or four nil. If it happens on Saturday then fine, but if it doesn’t we will move onto the next game. Southend's David Mooney misses a scoing chance in his side's 2-1 win over Posh at Roots Hall last season. “I’m staying positive. I’m seeing our current run as one defeat in five games rather than no wins in five games. “I’m convinced Tom Nichols and Paul Taylor will come good up front as well. They both come to work every day with smiles on their faces which is good. They know they are good players who will come good. They should know that a player as good as Craig Mackail-Smith used to miss a lot of chances, as well as score loads. 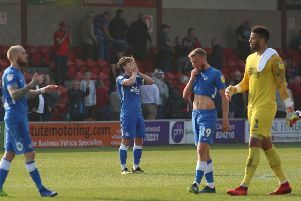 Posh launched an unsuccessful appeal against centre-back Ryan Tafazolli’s midweek (September 27) red card so Jack Baldwin will step in knowing a good display could see him stay in the side. Captain Chris Forrester should play despite struggling through the second-half at Shrewsbury with a knock. “Jack was unlucky to be left out in the first place,” McCann added. “He’s ready to play again and the whole squad knows if they play well they will stay in the side. “Ryan was playing well until his red card. We appealed on the ground that Michael Bostwick might have got a block in. “But Jack is a fine player and I expevct him to play well. “Southend have picked up lately. They’ve won their last two home games well, but with such an experienced manager in Phil Brown they were always going to turn it around. Southend are 19th in League One, but a win tomorrow would take them above ninth-placed Posh.